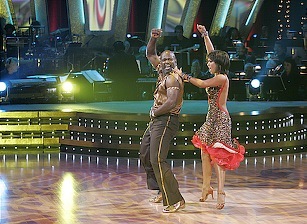 Emmitt Smith & Cheryl Burke lit up the cha cha cha Tuesday night. The pile driver vs. the heartthrob. Sir Shimmy against Super Mario. Manly Man takes on Boy Wonder. Whatever your take, Emmitt Smith is going to ballroom dancing's version of the Super Bowl, where he'll battle the favored Mario Lopez. Dancing with the Stars' top two sole men will floor it live next Tuesday before an audience that likely will top 25 million. It'll be one helluva hot ticket, lemme tell ya. Just don't let Paris Hilton in. Cripes, Uncle Barky, towel off and stop delaying the inevitable. OK, I was wrong in predicting that Joey Lawrence would sneak past Mario into the finals. Had a hunch and it didn't pay off. But I've had Emmitt tabbed to win the whole thing since the Oct. 24th show, so let's see if the NFL's all-time leading rusher can juke Mario and make it to the show's end zone. "This is why you enter a competition, so you can hopefully have a chance to fight for No. 1," Emmitt said Wednesday night. His partner, Cheryl Burke, has been there before. She teamed with Drew Lachey to win last season's mirror ball trophy, symbolic of bad craftsmanship. Every trophy takes on an aura of its own, though, so they could be battling for a pair of fluffy wabbit slippers and it wouldn't matter. Emmitt's adrenalin pump will be primed to Super Bowl proportions when he goes against the show's double-dimpled Gumby doll. He's got at least one big celebrity in his corner. Rachael Ray, who's been in the audience for at least one show, let it be known Wednesday night that "I want Emmitt to win. He's so smooth." On the other hand, Jimmy Kimmel says uh-uh. Emmitt has as much a chance of going all the way as Joey does of rushing for 1,000 yards in the NFL, he said. So there you have it. Longshot Emmitt goes toe to toe with hotshot Mario. Power vs. Speedo. Dallas against Southern Cal. A big contingent of Emmitt's old Cowboys teammates should be man enough to be there for him. If not, at least send flowers.